Approximately one in every 700 babies born in the U.S. has Down syndrome, or trisomy 21, a chromosomal disorder in which children are born with three copies of chromosome 21. Parents today have an abundance of available resources to help raise a child with Down syndrome, including geneticists who can speak to them about how this diagnosis may affect their child. Their child’s primary care doctor has likely taken care of multiple patients with Down syndrome and can be another good resource. 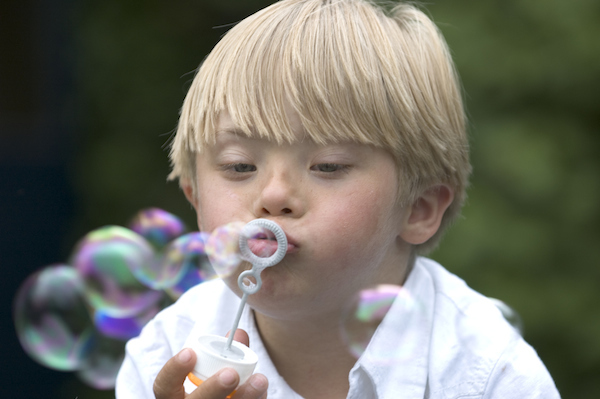 The Down Syndrome Association of San Diego can help parents connect with other parents of children with Down syndrome, and can help to reduce the anxiety that many parents will feel upon receiving that diagnosis. Learn more at www.dsasdonline.org. The life expectancy for people with Down syndrome was just 25 years old in 1983. Today, it’s 60 years old due to better screening and management for health conditions commonly seen in children with trisomy 21. Children with Down syndrome can have varying degrees of intellectual disability, ranging from mild (IQ of 50 to 70) to moderate (IQ of 35 to 50). Doctors occasionally see severe intellectual disability with an IQ ranging from 20 to 35. Growth is generally slower in children with Down syndrome. Doctors follow growth of children with trisomy 21 on growth charts specifically designed for them. About half of the children with Down syndrome have congenital heart disease. All children with trisomy 21 should have an echocardiogram to screen for heart disease. Children with trisomy 21 are also at risk for atlantoaxial instability and dislocation of the neck, which can result in spinal cord injury. Signs and symptoms of spinal cord injury are a medical emergency. Dr. Goldberg encourages parents and caregivers of all children to receive CPR training. “Children with Down syndrome are first and foremost individuals. There are certainly associated health issues, but those are not likely to be all consuming in each child’s life. It is important to remember that each child also has gifts and often brings much joy to friends and family,” Dr. Goldberg says. Information provided by the San Diego Sharp Health News Team. For more health stories visit www.sharp.com/news.